Oct 02, 2017 09:57 BST: BT, the Telecom Infra Project (TIP) and Facebook today announced the first three small and medium sized businesses (SMEs) to be admitted into the UK Telecom Infra Project Ecosystem Acceleration Centre (TEAC), based at BT Lab facilities in London’s Tech City and Adastral Park, Suffolk. The three companies will gain access to a pool of more than £125m in venture capital funding as well as support and expertise to help develop new innovative technologies aimed at boosting global connectivity, improving network user experience and lowering the overall cost of network infrastructure. The winners, Unmanned Life, Zeetta Networks and KETS Quantum Security, were announced after pitching their ideas to a panel of experts from BT, Deutsche Telekom, Facebook, Orange and TIP at the BT Tower. The selected winners provide solutions in the high-growth areas of autonomous unmanned systems (drones that rely on programming and communications with each other, rather than on manual operation), software defined networking (SDN) and quantum security. Zeetta Networks, also based in Bristol, offers software-defined networking technology to enable on-demand, network virtualisation and intent-based programmability softwarefor Operations, Administration and Management (OA&M) optical & wireless networks. The TEAC initiative is part of TIP which was founded last year by EE, Deutsche Telekom, Facebook, Nokia, Intel and SK Telecom. TIP is a global movement comprising more than 450 operators, infrastructure providers, system integrators, and other technology companies who want to challenge and transform the traditional approach to building and deploying telecoms network infrastructure. The selected SMEs are the first entrants to join the TIP Ecosystem Acceleration Centre (TEAC) in the UK, a programme announced by BT, TIP and Facebook earlier this year, which will help SMEs working in the field of network infrastructure to bring their innovative ideas to market more rapidly. In addition to providing visibility and access to funding, the TEAC will be a space for participants to learn how to adapt their solutions to the real operational requirements for rapidly developing areas of network infrastructure such as quantum networking, mission-critical communications, artificial intelligence and programmable networks. Theo Blackwell, Chief Digital Officer for London, said: “Fostering innovation is absolutely vital to the economic growth of both London and rest of the UK, so it’s great to see the telecom community coming together to boost SMEs and develop solutions that will help tackle the challenges facing the UK’s digital infrastructure. 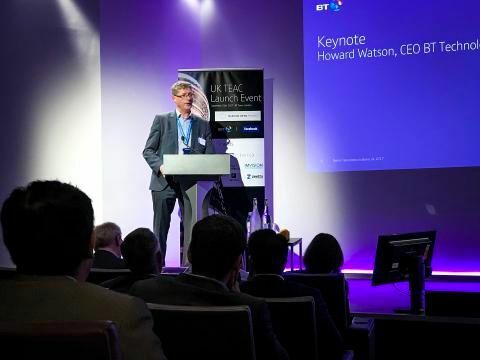 Howard Watson, CEO of BT Technology, Service and Operations, said: “It’s more important than ever before that we seek expertise not only from our home-grown talent and established partners, but also from newly created small businesses. Further selection rounds will be held on a regular basis, as the UK TEAC expands over the coming year.